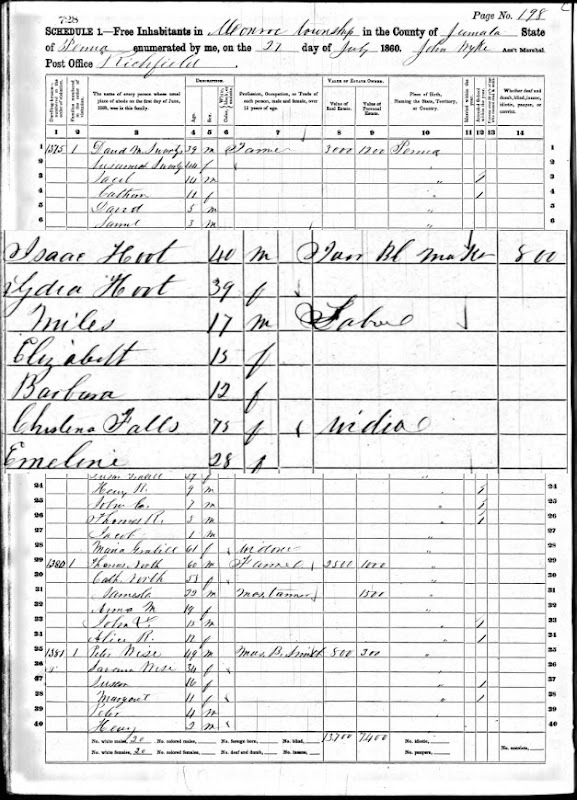 Census 1860 Chistina Falls "Widia"
Census 1860 for Richfield, Monroe Twp., Juniata Co., Pennsylvania. The following census shows Isaac Hoot and Lydia (Fall) Hoot. Lydia is the sister of George Fall, Samuel Fall, and Emeline Fall. Emeline is listed as living with Isaac and Lydia. Also, in the household is 75 year old Christena Falls. She is listed as "widia," presumed to mean widow. She would have been born around 1785. Since she is indicated as a widow, she would have married into the "Falls" family.